Price: $38990 - Restored classic! Welcome to THE VETTE NET a very proficient and knowledgeable online Corvette brokerage company. Since 1998, we have provided our professional broker services to the worldwide Corvette community assisting both buyers and sellers with their transactions. We look forward to assisting you. 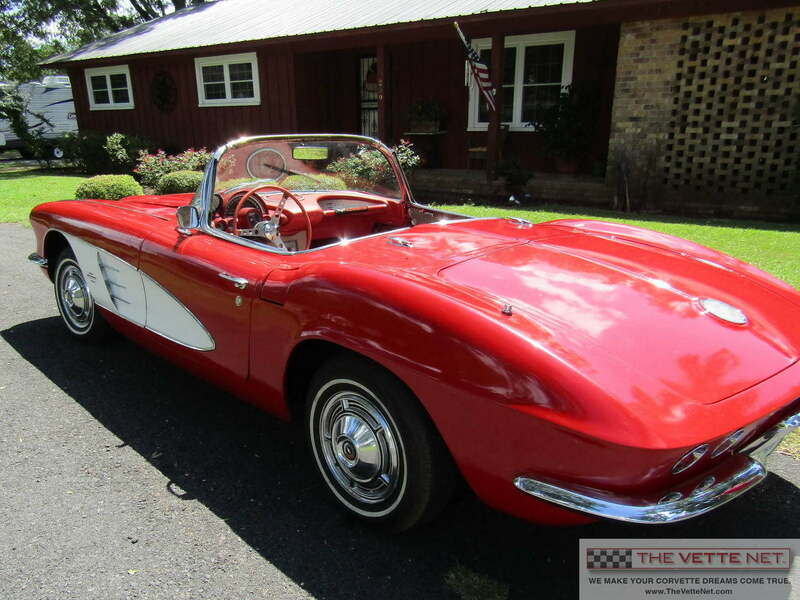 Our offer today is a beautifully restored 1961 Corvette dressed in the classy Red with White coves. For the better part of the last three years, it sustained a thorough on frame restoration where pretty much everything was addressed and taken care of, as shown the available receipts totaling $36000! It started its life as a Fuelie, and now it features a brand new 350/350 Chevy engine mated with a manual transmission. Note the detailed engine compartment! Body was stripped and painted, interior was completely redone with new parts, the only thing left being the door panels. It also has a black new soft top and the factory hard top is available, however, it will need to be restored. As mentioned, there a very complete list of all work and parts incorporated and we will be glad to share. Here is your chance to have a car which was sustained a thorough restoration with only several minor items left. Located in ARKANSAS, we will assist with delivery nationwide and all over the world. Corvette trades are considered.